here is one of the most powerful ministers (DEFENCE MINISTER) of the so called (rather self claimed) sixth super power of the world, right before taking charge of office !! 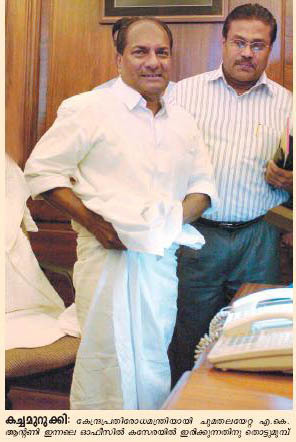 he looks happy to be draped in a khadi shirt and a dirty mundu (dhoti - for you non malayalis) ! i just cant understand what is stopping all these politicians turned ministers from getting atleast a bit neatly dressed (read - a neat shirt and a neat pant which might not cost more than a few hundred rupees - not asking for $5000 armani suits) especially when he has to represent india for many gatherings and meet a bunch of world leaders of similar stature ..
hello politicians, if you think by dressing like gandhi in the 30s and 40s you will also be considered one by the people, NO YOU ARE ABSOLUTELY WRONG. pothujanam is no longer a kazhutha. try changing your looks also with time. everyone knows you are no good than what you really are. 4) any issues ? just call the union leader beggars on their cell phones ! gosh !!! 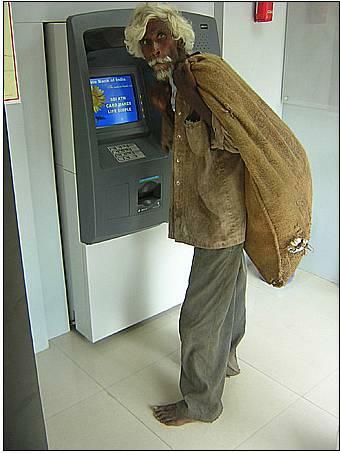 what else would we be hearing from these BEGGARS in future ? we accept credit cards also .. or .. please come and give the money or else there will be a surcharge for us to come to you and collect .. or .. late fees will be collected for delayed 'payment' ..
such a news !! click image for a larger view. those who can read malayalam may click this image below to read the actual news article ..
team outsourced to india ..
finally, the much anticipated MUD RUN 2006 got over this weekend leaving me still with a bunch of bruises, scratches and aches !! it was fun to re-live the whole experience but was hell while we were doing it. it was on 23rd (saturday). to those who dont know what this mud run is, here is brief description about it. this is the once a year open race where teams (of 4 members) run a 4.4 mile long obstacle (30 in number) course partly through some forests and partly through open land. this is supposedly the training course for the US marines - no wonder they are physically so fit and hence the official name of the race - US Marine Corps Challenge Run. i think close to 350 teams participated this year. we had named our team 'team outsourced to india'. there were many teams with stupid names like ours but the officers at the starting line had a nice hearty laugh when they had to read out our team name. the obstacles included 4 or 5 chest high walls which you have to kinda jump across, climbing wooden planks nailed across trees (they call it ladders and two were 15 feet high and one 7 feet high), running up hill with 45% incline, running across 7 or 8 huge pipes, going over and under a bunch of logs placed on pits which had chest level dirty water, crawling under nets placed on dirty water with very little space to breathe, multiple mounds of dirt (6-7 feet high), crawling under an army tank, long trenches filled with dirty water with two 'unexpected' pits with 7 feet depth (in one of which i literally drowned and someone else had to yank me out !! ), net climbing (where we saw one lady lying unconscious and officers getting ready to call medical help), 12 feet rope climb after swimming through a 20 feet long and 15 feet deep pit (for which i had to take a help from the officer who was standing by since i didnt know swimming - he threw a rope to hold on while he dragged me through this pit), walking on a rope with only another rope to hold, climbing a 10 feet wall with only support from your other team mates, rope swinging over a huge pit with water (felt like tarzan but i sprained my left ankle due to a bad landing on the other side !) and finally the casuality segment (stretcher carry) where one team member has to be carried on the stretcher for 100 yards by the other team members. http://www.usmcmudrun.active.com/ is the official website.